1. Uintah actively participates with the Bonneville CTC as a member of the Key leadership council. 2. Prevent substance abuse among youth and adults in Uintah. Underage drinking – isn’t it a rite of passage? Most kids will drink alcohol, won’t they? It can’t cause long-lasting harm as long as I monitor it, can it? As more research is done on the effects of underage drinking, we learn more. And what we are learning and what we know show clearly that if a person does not drink any alcohol before the age of 21, their chances of developing addictions are significantly reduced. And – since the brain is still forming connections, alcohol can impact and alter those connections. The only safe amount of alcohol for young people is zero. What can you do – how can you talk about this to your child? You can visit the, Talk, They Listen site and download the mobile app – then at any time you can browse different topics and be prepared for when you make an opportunity to talk to your child about why they should not drink alcohol while they are underage. Or go online from your computer/pad to browse and learn. We’re here to help – if you would like more information or are interested in joining our efforts (it takes as little as two hours a month to make a difference!) please contact us at BonnevilleCTC@weberhs.org. Thanks!! Take Back Day is October 27th!! Utah is 7th highest in the United States for overdose deaths – we must work together to fight the opioid epidemic right here in our community. How can you work with us? Simple – bring your unused medications to us on October 27th at Macey’s parking lot between 10:00 a.m. and 2:00 p.m. We will dispose of them safely for you. The disposal service is free and anonymous. Please note: needles, sharps, asthma inhalers, mercury thermometers, iodine-containing medications, and illicit drugs are not accepted at the drop box. According to the 2015 National Survey on Drug Use and Health, 6.4 million Americans abused controlled prescription drugs. The study shows that a majority of abused prescription drugs were obtained from family and friends, often from the home medicine cabinet.Take Back Day provides an opportunity for you to help prevent drug addiction and overdose deaths. We are looking for more volunteers to come learn about substance abuse misuse -- please join us. In as little as two hours a month you can make a significant difference in our community. Find us on Facebook – Bonneville Communities That Care Coalition or email us at BonnevilleCTC@weberhs.org. Take Back Day – Bring Your Unused Medications to US! For more than 15 years, Officer Jermaine Galloway has focused on drug/alcohol abuse prevention and enforcement. He has taught and given presentations to a diverse group of people, including fellow police officers, parents and teachers, treatment counselors, probation officers, law enforcement officers and religious leaders across the nation. 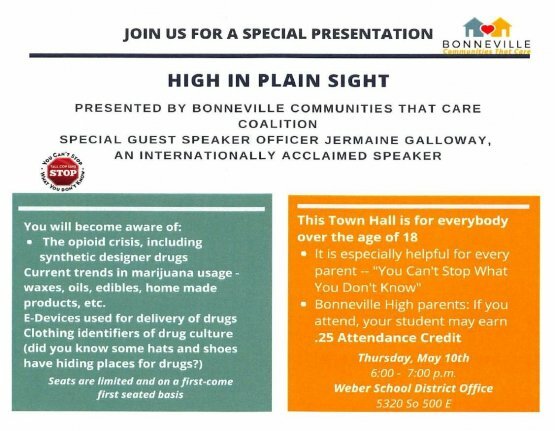 On May 10th, Bonneville Communities That Care has arranged to have him do a special presentation focusing on opioids and marijuana to our community members. This special Town Hall will cover alcohol and drug clothing, drug concealment methods, and a wide array of other important information. Two of his most recent awards include: In 2017, Officer Galloway won the national Enrique Camarena Drug Awareness award from the national Elks Drug Awareness Program. In 2015, Officer Galloway’s program, You Can’t Stop What You Don’t Know was highlighted in the book, “Clearing the Haze” – Helping Families Face Teen Addiction. Officer Galloway has presented to standing room only crowds for the Weber School District, don’t miss this opportunity to hear and learn from him yourself. This is a fast-paced, information-packed presentation. Seats are limited and on first-come first seated basis! Be sure to put this on your calendar and plan to attend now! Take Back Day provides an opportunity for you to prevent drug addiction and overdose deaths by simply bringing in your unused medications to our site – we’ll dispose of them safely for you so they are not accessible to others. Mark your calendar now, get out a bag and start collecting all of your unused medicine to bring to us. Saturday, April 28, 2018 10:00 a.m. – 2:00 p.m. Please note: We cannot take medications before 10 or after 2 so please be prompt! 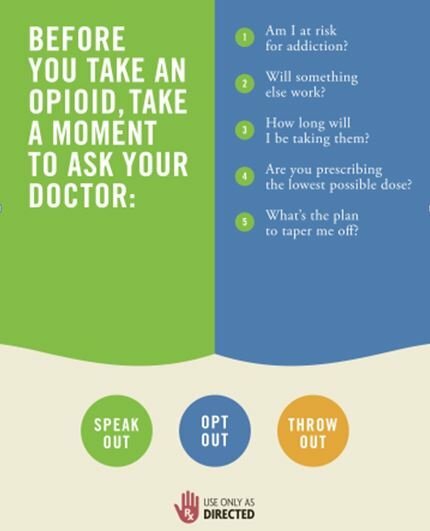 Have you been hearing about opioids? Probably so – they are receiving a lot of attention in the media. 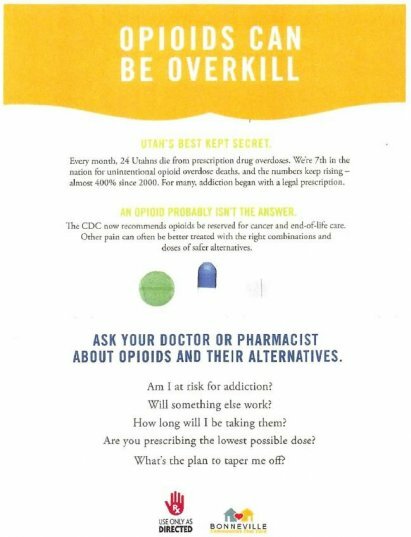 An opioid is a drug commonly used to treat moderate to severe pain. Opioids are used in hospitals and are sometimes prescribed by doctors to help treat more severe pain and discomfort. However, research suggests over-the-counter pain medications may actually work better for treating acute pain. 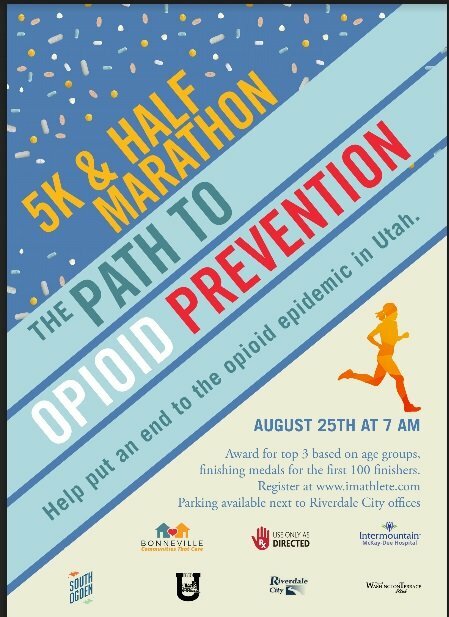 What you need to know: Addiction to prescription pain medications, (also known as opioids), is an epidemic in Utah and across the nation. For many, addiction began with a legal prescription. While there is much being done about this, much remains to be done. What can you do? To learn more about BCTC and what we do, visit us on our Facebook page: Bonneville Communities That Care coalition. Or send us an email: BonnevilleCTC@weberhs.org to receive more information – in as little as 1-2 hours a month you can make a difference – and have fun getting to know your community while you volunteer with us! Underage drinking – it’s a problem but there are some easy things you can do to prevent it. Believe it or not, teens still listen to their parents. In fact, kids usually listen to their parents more than anybody else, including their friends. In a recent survey on underage drinking, teens reported that parental disapproval is the number one reason they choose not to drink. Go to ParentsEmpowered.org (http://parentsempowered.org/how/parenting/) for some quick, easy tips. While you are there, click around, there are several articles and ideas you will find interesting. Want to know more about how you can prevent underage drinking and drug use? Join us – we’re a group of concerned citizens, parents, grandparents, and others (Council member Bell serves on one of the workgroups, too). We have a lot of things going on and need your help. You choose what you want to do, and how much time you have to donate, we provide you with free training. In as little as 1-2 hours a month you can make a difference – email us at BonnevilleCTC@weberhs.org, call us at 801-625-3687 or find us on Facebook (https://www.facebook.com/BonnevilleCTC/) to learn more, we hope to hear from you soon! Underage drinking impairs brain development. The brains of teenage drinkers often aren’t as active as the brains of nondrinkers, even when sober. Alcohol wires teen brains for addiction. Studies show that people who begin drinking before age 15 are four times more likely to become alcohol dependent at some time in their life, compared with those who have their first drink at age 20 or older. Bonneville Communities That Care coalition has been working to prevent underage drinking and other drug use for over five years working with the citizens of Riverdale, South Ogden, Uintah and Washington Terrace cities. Our main focus is on all of the children who attend schools that feed into Bonneville High School, however, the whole community benefits from our efforts. Our efforts are only effective if we have the support from the entire community – we need YOUR help. Please join us! 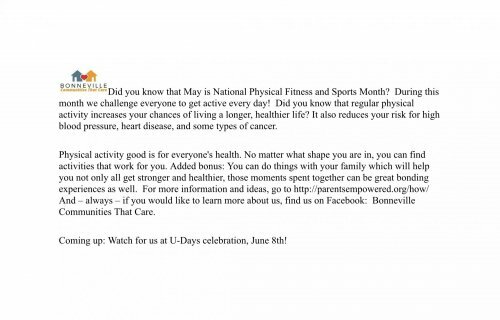 To learn more, find us on Facebook (Bonneville Communities That Care Coalition) or call us at 801-625-3687. Each city has sustained their level of effort and commitment to the coalition, in addition, the coalition has received grants and donations totaling over $150,000.00 a year. We’ve collaborated with law enforcement and local businesses to host four prescription drug Take Back events. Residents bring in all unused medications to these events and police officers take them to be disposed of at a nearby facility. Our efforts have grown exponentially, from filling shoe boxes at our first event, to gathering over 200 lbs at last spring’s take back event at our location - 1400 lbs were taken in at the county-wide event. We are now doing two per year to help increase public awareness of this issue and to provide an additional venue for people to drop off unused medications. The coalition hosted a Naloxone Training. Following the meeting, over 30 naloxone kits were distributed to coalition members. Disseminated 150 free trigger locks to support suicide prevention efforts. The coalition identified building stronger relationships with all schools in the area as a priority. One effort hosted by Riverdale Mayor Searle and Washington Terrace Mayor Allen led to prevention programming in two of our elementary schools culminating in night concerts performed by students with nearly 2,000 people from our community attending. These concerts focused on what parents can do to eliminate underage drinking. Most importantly, drug use has declined, risk factors have decreased, and protective factors have increased since the coalition started! Below is a graph showing our community priorities and the success we’ve had at addressing them. While the nature of prevention work is that it will always need to be done, we are proud of the successes we’ve had and that we have contributed towards in our communities. We are committed to continuing these efforts and invite everybody to join our efforts by calling 801-625-3687. Training is provided free of charge – it’s a great opportunity, call us now! Bonneville Communities That Care (CTC) is a coalition-based community prevention operating system that uses a public health approach to prevent youth problem behaviors including underage drinking, tobacco use, violence, delinquency, school dropout and substance abuse, and issues related to mental health such as depression and anxiety. Ultimately, the beneficiaries of CTC are the entire community. As children become more healthy and make fewer poor choices, communities see less vandalism, gang activity, shoplifting, drug use, school drop out, and fewer unwanted teen pregnancies.. CTC helps decision-makers in the community select & implement effective prevention policies and programs to address the most pressing issues facing their youth. CTC guides the community coalition through an assessment and prioritization process that identifies the risk and protective factors most in need of attention, and links those priorities to prevention programs that are scientifically proven to work in addressing them. CTC activities are planned and carried out by the CTC Community Board, a prevention coalition of community stakeholders who work under the direction of city and community leaders to promote positive youth outcomes. 5) Implement and Evaluate—implementing the new strategies with fidelity, in a manner congruent with the programs’ theory, content, and methods of delivery, and evaluating progress over time. Results from a rigorous study across our nation show that within four years of adopting the CTC system, community coalitions can significantly reduce the incidence of delinquent behaviors including alcohol, tobacco and other drugs. · In 8th grade, students from CTC communities committed 31% fewer different delinquent behaviors than students in the control communities. Bonneville CTC is in Phase Four - we will be writing and approving the Community Action Plan in the next two months. JANUARY 2012: Increasingly, City residents are impacted by substance abuse. The heartache and concern caused by substance abuse among friends and family and recent arrests at Bonneville High School substantiate the need for increased efforts toward substance abuse prevention. The Bonneville CTC is moving forward with this struggle. Please observe the progress reflected on the website http://www.bonnevillectc.org/ . There is a link to this website from the City webpage. Click on About from the Home page. You can help! 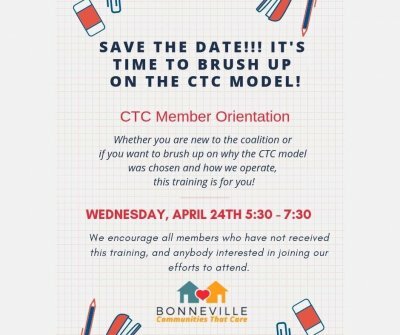 Call the Bonneville CTC coordinator Amy Mikkelsen at 801-529-2866 if you have suggestions, ideas, concerns, or would like to be part of the Bonneville CTC as a member of the Community Council. MARCH 2012: The City Council voted in February to continue support for the Bonneville Communities That Care with the challenge to prevent substance abuse and with its related offenses. The City’s responsibility to provide for public safety carries with it the charge to mitigate the high cost of substance abuse and deviant behavior which is at the root a heavy financial burden to the community. Please consider getting involved to add your voice and talents to the many other volunteers who care enough to get involved with this growing concern. APRIL 2012: When a young person perceives that the adults in the community value youth and are given useful roles in the community that young person is far less likely to try out risky behavior. With that in mind, please take every opportunity to show an interest in the young people. It may be just a friendly greeting. It may be that you notice some accomplishment and let them know you are aware. You could find out about the newly organized Uintah Youth City Council and find a way to encourage them and their leaders. The benefit of these little acts to the young person, the community and you will be far reaching. MAY 2012: Last month in this column, I invited you to find an opportunity to let the youth know that they are valued here in this community. The youth are our greatest resource! As an alert member of this community, let me know by phone or email of the good things that our youth are doing! I will share them with the rest of the community in the June newsletter. At the conclusion of the school year there will be awards, graduation, scholarships and lots of other accomplishments.